Some of the biggest wedding trends are damask patterns, do-it-yourself decorations and budget wedding planning. 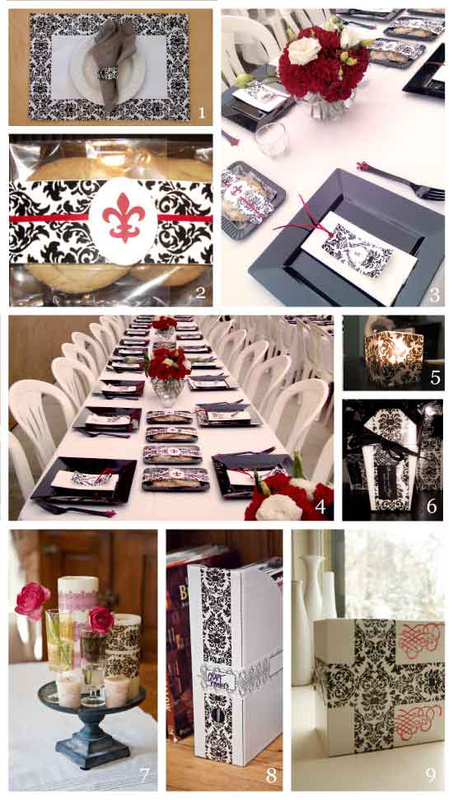 Here's nine inspiring ideas how to use TapeSwell's Damask Tape for your budget-chic wedding planning, and they can work well for engagement parties or any DIY entertaining you might want to do. 3. Dinner menu / monogramed bookmarks. 4. Black, white and red spells chic. These three colors work very well for weddings in the winter months - especially for February and March weddings. 7. Candle centerpiece. Candle centerpieces are a romantic way to decorate your wedding and adding patterns makes them light up with style. 8. Wedding planning book / Make your own guestbook. There is no reason why you shouldn't coordinate your wedding planning book with the rest of your wedding theme. Also, guestbooks can be expensive to purchase, but repurposing a nice notebook is very easy and budget friendly. 9. Don't forget the gifts for the wedding party! Have you been inspired? Let us know which of these ideas are your favorite. Do you have your own ideas for DIY wedding decorations? Write your ideas in the comment box below, or submit your photos to tackyideas (at) tapeswell.com and your creations might be featured on our blog.